Prosthesis is the world's first, purpose built, off-road racing mech. 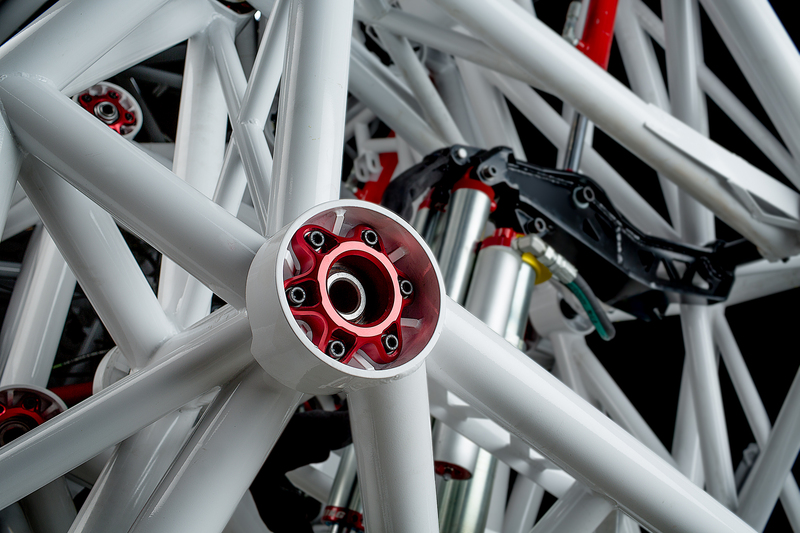 Prosthesis is the flagship machine in the inception of an entirely new human experience - mech racing. With extensive support from academic partners like The University of British Columbia and countless industry supporters, Tippett and his team were finally able to complete Prosthesis in partnership with Furrion, a global technology leader in early 2017. This partnership has lead to the formation of Furrion Exo-Bionics, which will continue to develop the technology and build the new sport of mech racing. Motion system: 100% human controlled, electro-hydraulics with direct haptic feedback. Prosthesis was built for the pilot. The primary objective of the project was the creation of a responsive, stable and powerful exo-bionic platform that amplifies the motions of of a human pilot. Prosthesis is a sports machine and requires a trained athlete to operate. Prosthesis was developed in the Lab, but designed and built for the real world. With massive suspension travel and a trained human pilot at the controls, Prosthesis will be capable of tackling any terrain at top speed. Prosthesis marks the inception of a new, large scale exo-bionic technology platform. We believe the future belongs to high power, compact mobile electric power systems and we are committed to being leaders in the field. © 2019 Prosthesis . All Rights Reserved.